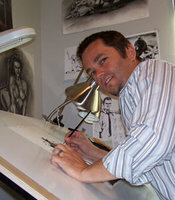 Rick Marcks is a professional freelance illustrator, comic-book artist, and writer. He illustrated the children's book 'Little Lucy, Big Race' written by Matt Roloff, and the guidebooks for the popular RPG 'MotoBushido'. The comic-book 'Outroute 12', written and illustrated by Rick, funded at over 300 percent on Kickstarter. His artwork and designs have appeared in the TV show 'Little People, Big World', as well as, comic-books, company logos, T-shirt designs, prose novels, and storyboards. Born and raised in Oregon, Rick lives to tell stories and entertain people with his art, he also enjoys building and riding custom motorcycles. Sign up here for a FREE copy of the comic JAILHOUSE MOUSE.